When musicians turn their hand to acting, the results can often not be pretty. Even if the film in question isn't already a vanity project about the musician's life (Glitter, Purple Rain, Moonwalker and so on), there's a tendency for singers to either play themselves or needlessly draw attention to their presence. Sometimes this can work to the film's advantage - for instance, David Byrne in True Stories - but for every figure like David Bowie who can serve a role, there are a dozen singers who simply can't fit in. Sometimes you get even both phenomena in the same film, as was the case in Ken Russell's Tommy: Tina Turner excels as the Acid Queen, while Eric Clapton (with both a real and a fake beard) is barely credible. 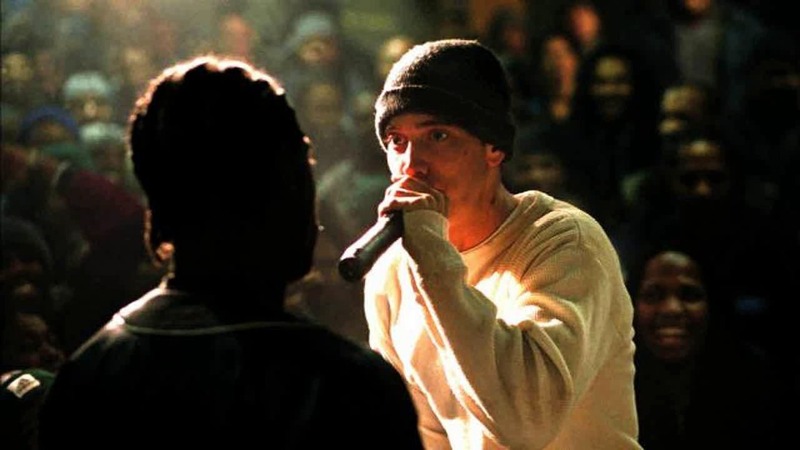 8 Mile came at a time when Eminem was at the peak of his powers. On the back of The Marshall Mathers LP and The Eminem Show, which brought him both hit singles and critical praise, it would have been extremely easy for him to coast on a project like this. Instead, we get a very fine performance in a film which avoids some (but not all) of the cliche-ridden pitfalls of the rags-to-riches story. While not perfect, or Curtis Hanson's finest film, it is a gritty and absorbing project which still holds up very well after 15 years. One of the first challenges that any film about music has to do is to explain the appeal of the music and its surrounding culture to an audience that may have no familiarity with it. Because of the prevalence of rap and hip-hop in mainstream culture, it would be easy to assume that the paying public would go along with every aspect of the world that is put in front of them. But because this is a period piece, which takes place in a very specific context within the history of American music, that simply isn't an option. This is the mistake made by Notorious (no, not the Hitchcock film), which assumed that its audience would already be experts on Notorious B.I.G. and therefore didn't feel the need to rationalise the hagiographic reputation it accorded him. 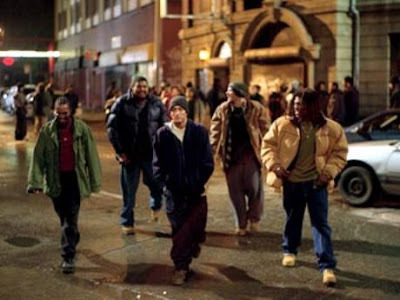 8 Mile's first success is that it triumphs where Notorious sank without trace. Even if you're not a fan of rap music (and I include myself in this category), the film gives us a sufficient grounding in the world of mid-1990s Detroit to understand why this music has a pull on young men, and why Rabbit would feel the need to prove himself in this way. Just as the mod movement in London in the 1960s provided an outlet for young men who laboured away in factories by day ("the dirty jobs" of Quadrophenia), so the rap battles provide an outlet for the all the frustrations, ego and anxiety experienced by these young men. By focussing on the plight of disenfranchised, alienated young men in an unforgiving landscape, the film merits close comparison with La Haine, and by extension Saturday Night and Sunday Morning. While there are some clear narrative similarities - the protagonists are all three young men, who undertake some form of manual labour to get by and feed their respective vices - there is a big difference in emphasis. Both Mathieu Kassovitz and Karel Reisz are interested in the social conditions which could have produced their leading men, whether it's the banlieues of Paris or the post-war streets of Nottingham. 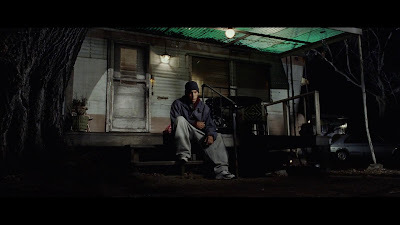 Hanson, by contrast, keeps Eminem and his character's journey front and centre, with the setting increasingly fading into the background. That's not to say, of course, that Hanson's rendering of 1990s Detroit is completely unremarkable or inconsequential. He's assisted ably in this regard by Rodrigo Prieto, who was Oscar-nominated for his work on Silence and Brokeback Mountain. More pertinently to this film, he shot Amores Perros, and the film benefits from his gritty use of handheld cameras and claustrophobic lighting choices. While the rendering of the landscape is not the most groundbreaking for its subject matter, it is effective in getting across what might be called the prison of familiarity: the main characters are desperate to get out of their situation in some way, but always end up staying because this world is the only one they know. Reviewing the film for The Chicago Sun Times, Roger Ebert praised the film for essentially not having a third act. In the traditional rags-to-riches model, the protagonist goes through the many trials of the story to emerge intact, leave the confines of the society in which they found themselves at the start, and go off to achieve their dream and enjoy success. 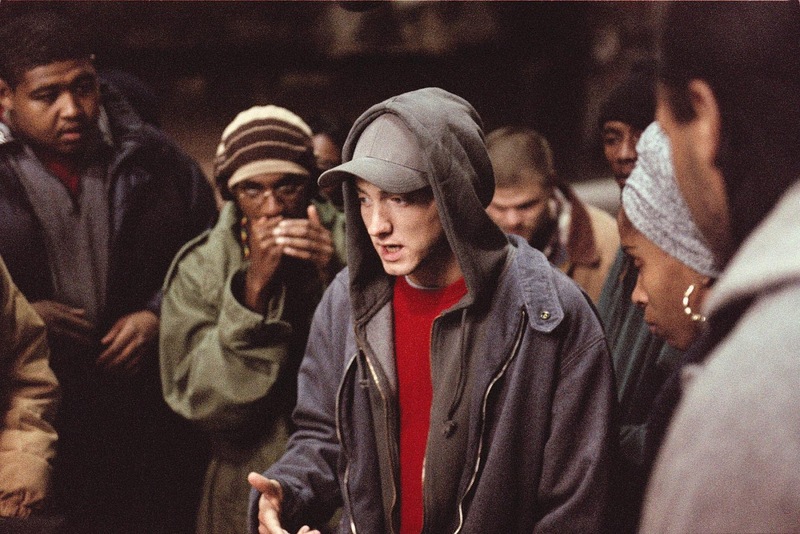 Ebert wrote: "[8 Mile] "avoids the rags-to-riches route and shows Rabbit moving from rags to slightly better rags... I would love to see a sequel in which Rabbit makes millions and becomes world famous, and we learn at last if it is possible for him to be happy." Deliberately neglecting to have a proper third act is not a creative decision that works well in all situations - Sofia Coppola's Marie Antoinette, for example, suffers greatly from ending in the wrong place. But in the case of 8 Mile, it's a narrative decision which pays off, because it compliments the gritty feel for which Hanson is striving. Situating fairy tales in a gritty environment can work brilliantly well - Hard Candy and Heartless being great examples - but you have to establish the rules of engagement very early on. Introducing a fairy tale ending to a gritty, realistic story can regularly prove jarring, turning an earthly drama into a cheap and frothy melodrama. With 8 Mile, there is a conscious effort from Hanson and Eminem to hammer home the disjunct between the emotional feeling of success and the practical benefits that it brings. Rabbit rises in status by the end of the film, earning respect after his initial failure, but in the end he is still living in a trailer park with his family, working a boring, unrewarding job and just about staying on the right side of the law. The downside to this approach is that the film occasionally feels repetitive or drags; we know that some kind of uplift is coming, because the story is well-worn, and there are times of wishing that it would just cut to the chase. But the film deserves credit for not taking the Hollywood route at the ending; it may not be making any kind of profound political point in this decision, but it is the right way of doing it. All of which brings us on to Eminem's performance. Rappers have in the past been particularly guilty of just playing themselves in films; Ice Cube has carved an entire film career out of shouting and chewing the scenery (Boys n the Hood notwithstanding). 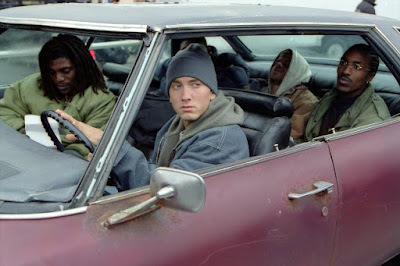 But even though Rabbit's story is a partial reflection of Eminem's own life, there is nothing either self-conscious or narcissistic about his performance. There's a vulnerability to him which isn't always present in his music, and he commits to the character, fighting any urge to showboat or break the fourth wall. It's a very fine performance, culminating in the excellent final rap battle and his Oscar-winning rendition of 'Lose Yourself'. Outside of Eminem, the supporting cast of 8 Mile do a very good job. Casting Kim Basinger as Rabbit's mother was a sore point for many critics, who felt that she was too glamorous to pull off the part. But Basinger, who worked with Hanson previously on L. A. Confidential, acquits herself perfectly well, consciously and deliberately downplaying even her most emotional scene so that Rabbit's story and experience is always in the foreground. Britanny Murphy, who was great in Girl, Interrupted, adds a real spark as Rabbit's love interest, adding it to her impressive roster of compellingly fractured supporting characters. Watch out also for brief appearances by Boys n the Hood director John Singleton (as one of the bouncers), future Percy Jackson star Brandon T. Jackson and fellow rapper and Pimp My Ride host Xzibit. There are a couple of issues with 8 Mile which prevent it from being a masterpiece. For all its attempted departures from convention in the final half hour, it's still a deeply generic beast which makes too little of its opportunities to depart from the Rocky formula. And despite us knowing for the most part where the story will go, the film is still very loosely edited; it doesn't have the raw, breakneck intensity that made La Haine so good, and there's only so much we can look at a run-down street before we start to lose interest. 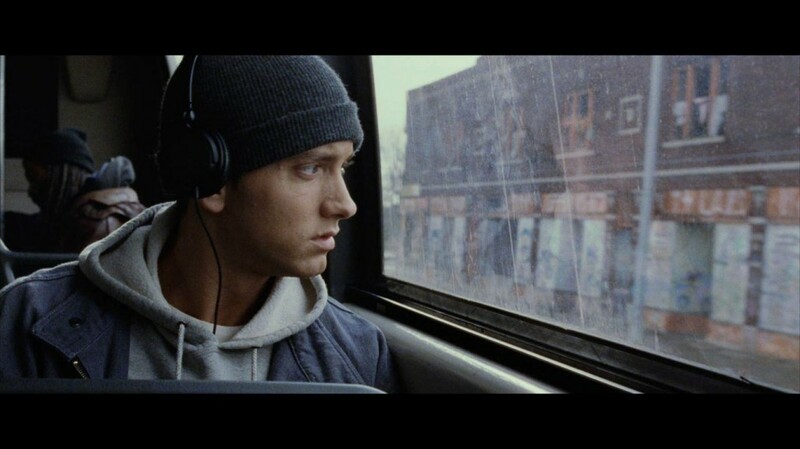 8 Mile is a gritty and gripping drama which has generally aged well and remains one of the highlights of Eminem's career. While it's hardly the most original story ever told, and some of its execution could have been tightened up in the editing suite, there is enough in both the narrative and the performances to carry us through and keep us interested. If nothing else, it's a good reminder that singers can occasionally hold their own in cinema, and while it isn't Hanson's greatest film, it is still a worthwhile watch.